We here at the House of Rock try to live life on the precarious line between fun and stupid. But I’m getting ahead of myself. 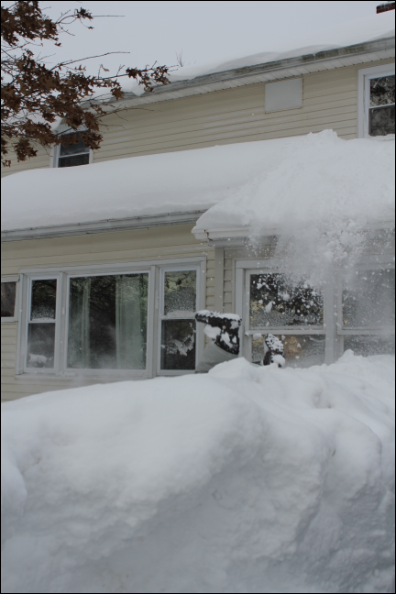 Last night into this morning, Connecticut received quite a pounding of snow. For a place that usually gets no more than few 6 inch snow storms each year, this 18 inch storm caused some inconvenience. But with snow, comes adventure. 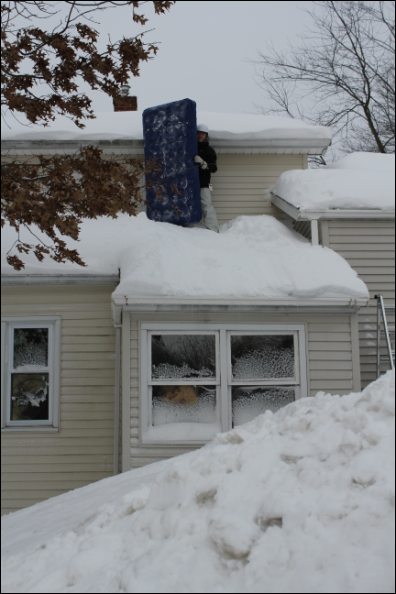 This time we decided to try sledding off the House of Rock roof. Shaun and Nick zipped down to target to try and pick up a sled. Unfortunately, sleds were $35. So they settled for a $10 twin air mattress instead. 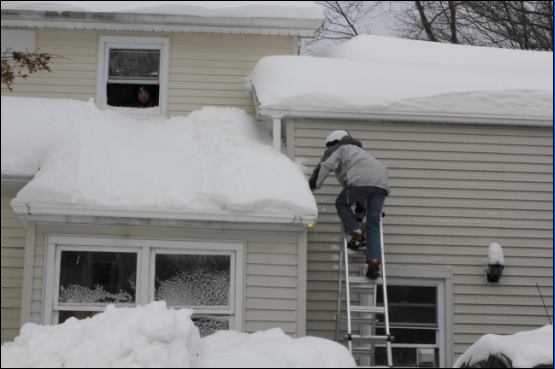 We set up a ladder onto our roof and climbed out. 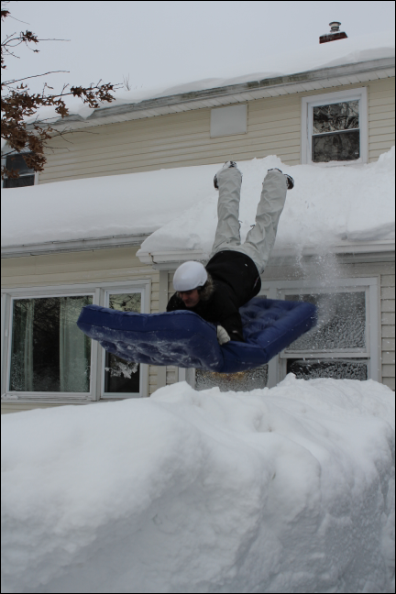 Getting ready for some Mattress roof sledding. The House of Rock has a three tiered roof. Going off the garage would have been pretty much a ticket to the ER, as the driveway is far below and, at this point, very pavement-y. We debated going off the top roof, but as this was our first attempt, we felt anything higher than the first tier might be asking for trouble. Shaun getting ready for flight. Face first? Shaun's such a rebel. We each took a couple runs. And in the photos above Shaun was only mildly hurt. I have some video that I’ll hopefully have a chance to edit and post. In general? 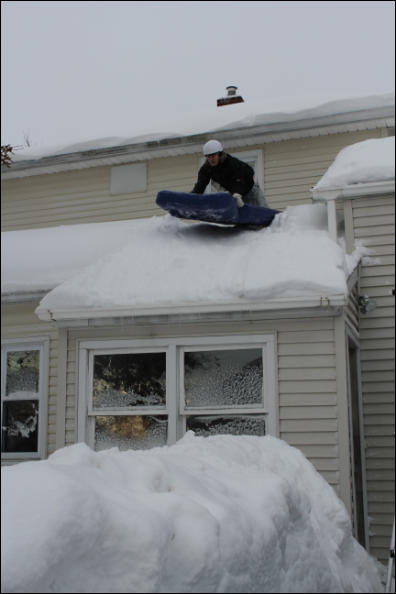 Roof sledding was a resounding success. Laugh through the pain Shaun. Laugh through the pain. I am impressed! 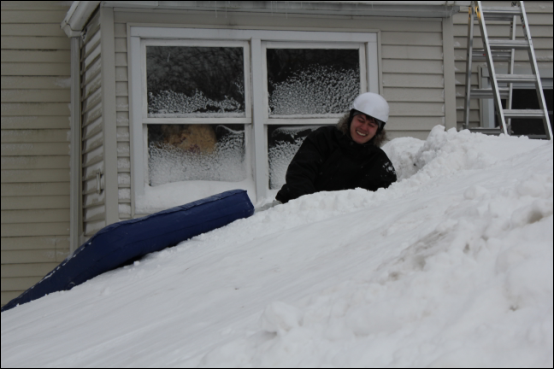 I settled for the $7 plastic saucers which due to low lips required me to carve out luges on the lawns first before I could go down. 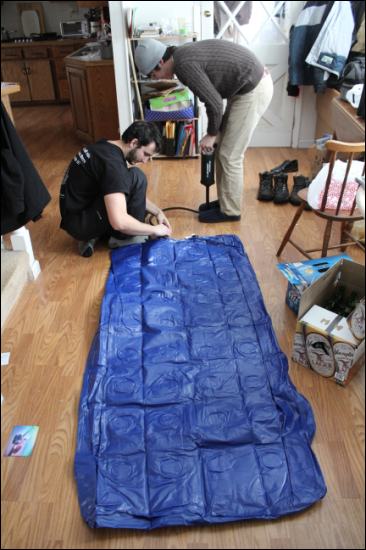 Sander did that very same trick when he was nine-only sans the air mattress and he chose the driveway for the landing. His friend was so upset he couldn’t talk. I was so upset I said words that still make me blush. I’m glad to see that you decided helmets would be a good idea for this activity. To be fair: I CHOSE the back yard for my landing, where the roof went down to within 4-5ft. of the ground. I ENDED UP in the driveway (12ft.) – turns out frozen roofs are slippery. I don’t think Mom is going to like this one.